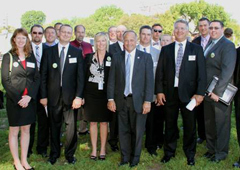 Congressman King (center) with members of the Farm Bureau at the farm bill rally. The battle to pass a new farm bill hit full stride on Wednesday among Iowa’s congressional delegation. Various groups rallied at the capitol in Washington, D.C., calling for passage of a new farm bill before the current bill expires at the end of September. Congressman Bruce Braley, a Democrat from Waterloo, attended the rally and in his weekly conference call with reporters, blasted the Republican House Speaker for failing to take action. “Up to this point, I’ve been reluctant to inject politics into this debate, but one man has been solely responsible for keeping the farm bill from coming to the floor, and that man is John Boehner,” Braley said. 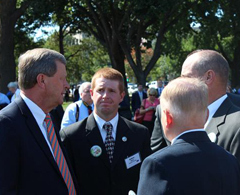 Congressman Tom Latham, seen here in the left of the picture, at the farm bill rally. Congressman Steve King, a Republican from Kiron, issued a release with a picture of him at the farm bill rally. In that release King criticized Democrat Nancy Pelosi, the former House Speaker for holding up the farm bill vote “because of its reforms of fraud and abuse” in the food assistance program. Republican Congressman Tom Latham of Clive, also issued a news release which featured a picture showing him at the farm bill rally and called for passage of the new bill. The campaign of Democrat Congressman Leonard Boswell of Des Moines issued a statement criticizing Latham for what it said was Latham’s “inability” to bring the farm bill to the House floor for a vote. Boswell also criticized Latham’s relationship with Speaker Boehner. Boswell and Latham are incumbents running against each other after Iowa lost one congressional seat following the 2010 Census. There has been a proposal to extend the farm bill for one year, but Braley says that’s not the best solution. Iowa’s other Congressman Dave Loebsack, a Democrat from Iowa City, issued a news release earlier this week saying a one-year extension of the farm bill would be “kicking the can down the road,” and he urged passage of a five-year bill. “I was pleased to attend today’s rally and join members of the Iowa Corn Growers Association and the Farm Bureau in calling for swift action on the Farm Bill,” said King. “For weeks I’ve been working with House leaders and rank and file members of both parties to try to build a bipartisan coalition to get the bill to the House floor, get it passed, and get it to Conference with the Senate. “We passed a Farm Bill out of the House Agriculture Committee with significant bipartisan support in July. We knew bipartisan support was necessary to get the bill through the committee, and I worked with Chairman Lucas, Ranking Member Peterson, and my colleagues on both sides of the aisle in the Committee to get that done. After it passed the Committee, we knew we’d need that same kind of bipartisan support to move the bill to the House floor and get it passed. Unfortunately, Nancy Pelosi is encouraging her Caucus to oppose the bill because of its reforms of fraud and abuse in the SNAP program, making it difficult to get support from the other side of the aisle. “Apparently, in the weeks leading up to Election Day, Nancy Pelosi sees a political advantage in opposing this bill and whipping a ‘nay’ vote. But the Farm Bill is too important to play politics. Our farmers and producers need the certainty that comes from a long-term Farm Bill, and they need it now. Iowa Congressman Tom Latham joined Iowans, members of the agriculture community and fellow lawmakers Wednesday morning to rally on U.S. Capitol grounds in favor of a new five-year Farm Bill. Current farm programs are scheduled to expire at the end of September. The most recent five-year farm bill, the Food, Conservation, and Energy Act of 2008, became law in May of 2008. This legislation expires at the end of the current fiscal year, September 30, making it necessary for Congress and the White House to enact new legislation to extend agriculture programs. Wednesday’s rally featured a bipartisan group of speakers from the United States House of Representatives and Senate. Additionally, according to the National Farmers Union, the event was endorsed by more than 80 organizations representing a broad range of associations and coalitions representing commodity crops, livestock, dairy, specialty crops, state and local governments, minor crops, energy and biobased product groups, farm cooperatives and financial groups. Among those represented was the National Corn Growers Association. – Today, the Boswell campaign blasted 9 term Congressman Tom Latham for his continued inability to bring the Farm Bill to the floor for a vote. Congressman Latham is taking a photo op by appearing at the Farm Bill Now rally but before the August recess, he was the only member of the Iowa delegation who voted to adjourn and campaign rather than stay until a Farm Bill was passed. With Iowa farmers in the midst of the worst drought in decades, the need for a Farm Bill has never been greater. Farmers have struggled to feed their herds and save their crops. As Boswell frequently points out, a Farm Bill is written every five years, so this year’s bill didn’t come as a surprise to Congressman Latham or any of his right wing buddies in Congress like Eric Cantor.